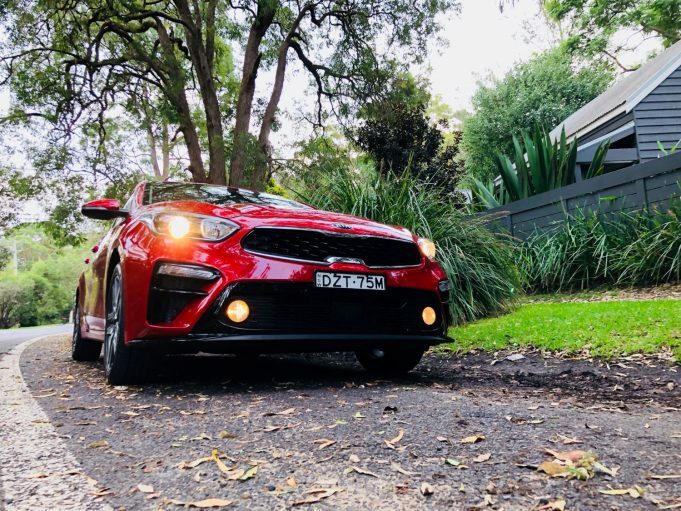 THE 2019 Kia Cerato Sport hatch is a car that does everything well, without being all ‘look at me’. It’s comparable to the kid in your class at school that goes about his business without being an attention seeker, and grows up to be a successful bank manager. The Cerato Sport has a stylish exterior, but it takes time to appreciate it. From the subtle sports body skirts, to the nicely nestled front driving lights, this car is aesthetically pleasing. Sit back and stare at it, you’ll see what we mean. 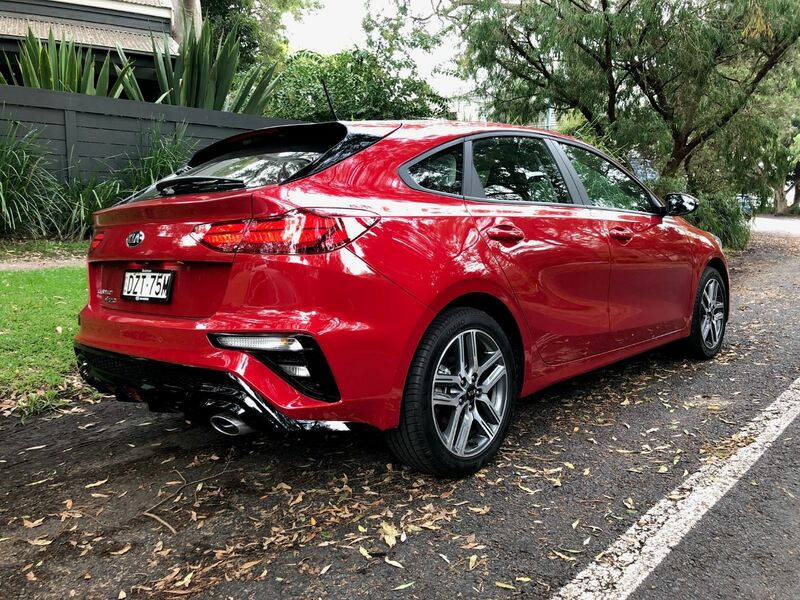 The Lines of the 2019 Kia Cerato Sport are quite sleek and sharp, and add to the overall appeal of the hatch shape. The chrome tip of the exhaust that peeks out from under the rear body skirt look neat and as if it’s supposed to be there. If you haven’t worked it out already, that’s our point; everything has a purpose, functionality wise, on this car. There’s nothing glaringly obvious that looks out of place or like it was added for the sake of it. The 17-inch alloy wheels are understated, which again fits the theme of this car. 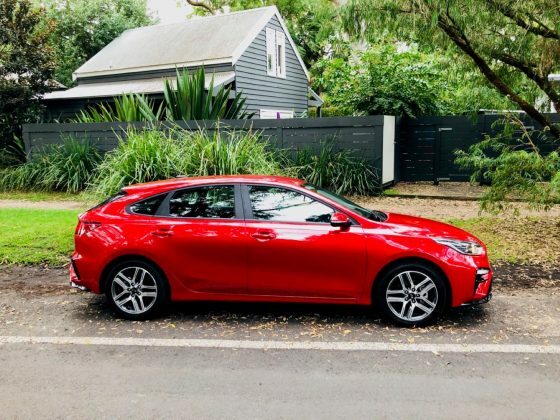 They are wrapped in 225/45 R17 Michelins and the combination of the two gives a good feel to the front wheel drive hatch and road noise in the cabin is quite acceptable. Performance is fed from the 2.0-litre 4-cylinder petrol engine under the bonnet, which produces 112kW of go and is mated to a six-speed automatic transmission. Power is delivered smoothly, although it does feel a little sluggish down low in the rev range. There is no manual transmission or even paddle shifters for this variant, despite being branded a ‘sport’. That’s part of the issue with Kia’s naming convention on the Cerato; things you think should be sporty, aren’t. The suspension offers a smooth and comfortable ride for driver and passengers alike, and is responsive enough without being outstanding. Our test vehicle was supplied in Runaway Red and offered a nice contrast with the gloss black sports body kit. The Cerato Sport is also available in Aurora Black, Gravity Blue, Steel Grey and Snow White Pearl, along with a few other colour options. Inside, the understated theme continues. It’s nice, but there are no stand out hero features. The seats are comfortable, and covered in a durable cloth trim, which is nicely finished. The whole interior in fact, is genuinely comfortable to work with. There’s also plenty of room in the back seats for the kids. In fact there’s enough room for two large adults. And it won’t be cramped either. 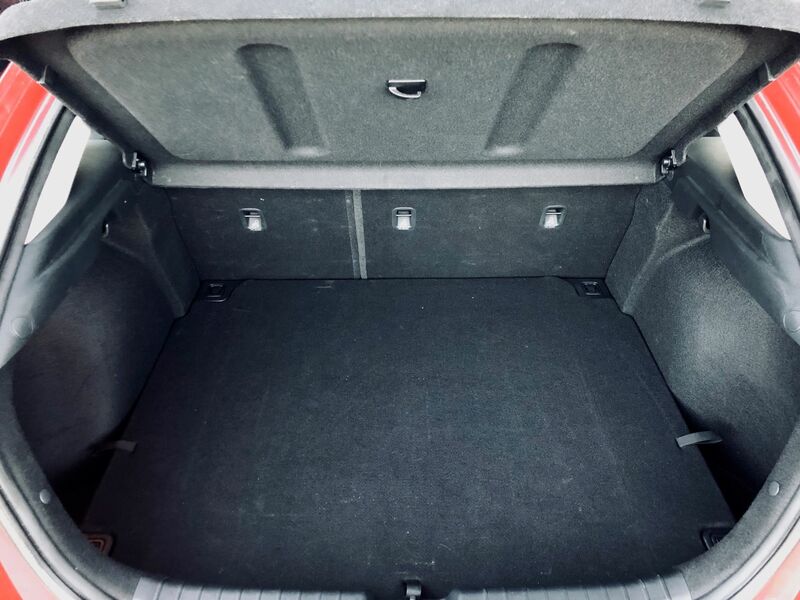 A decent amount of boot space is also on offer, and that grows nicely when the 60/40 split-fold rear seats are laid down. 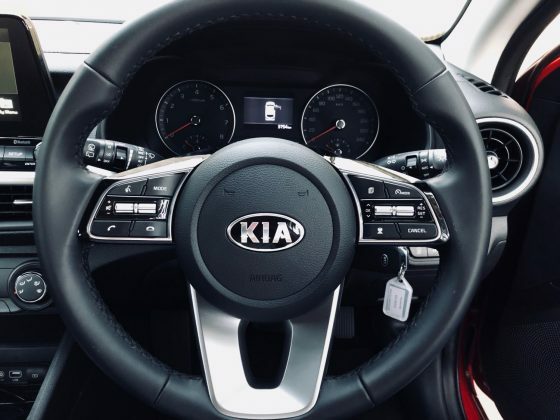 Like all Kia models we’ve tested in 2019, the infotainment system is excellent. With a class leading reversing camera and excellent satellite navigation, it’s a first class offering, with Apple CarPlay and Android Auto as standard, with tunes pumped through six speakers. Functions are driven from either the 8-inch display or the steering wheel. We scored the safety pack in the version we drove, which includes blind spot assist, lane keep assist, rear cross traffic alert, electronic stability control, and ABS. There’s also a speed limiter warning just so you don’t get to carried away. The Cerato Sport is happy running around town doing the daily duties and is just as joyful cruising on the freeway. There’s not a lot of additional power on tap should you need to do any quick overtaking maneuvers though. Priced at $25,690 drive away, the 2019 Kia Cerato Sport offers exceptional value for money motoring. Perhaps one of the Cerato’s biggest features is its 7-year unlimited kilometre warranty, which is sure to make any bank manager smile. 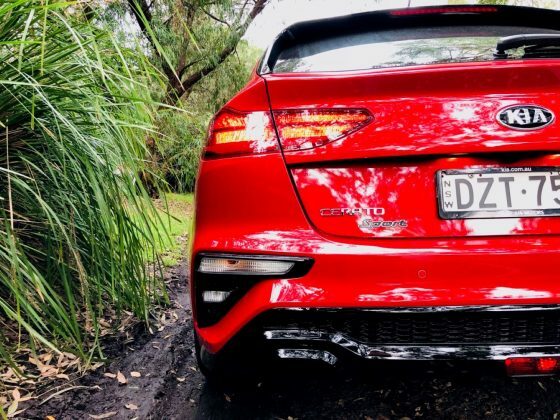 In a market segment that boasts competitors such as the Toyota Corolla, the outgoing Mitsubishi Lancer and Holden Astra, the Kia Cerato Sport is certainly capable of mixing it with its rivals. Our test vehicle was provided by Kia Australia. To find out more about the 2019 Kia Cerato Sport (hatch), contact your local Kia dealer. Pros - 7-year unlimited kilometre warranty; excellent reversing camera and SatNav; value for money. Cons - no key less ignition; lacks sporty performance; calling it a 'sport'.